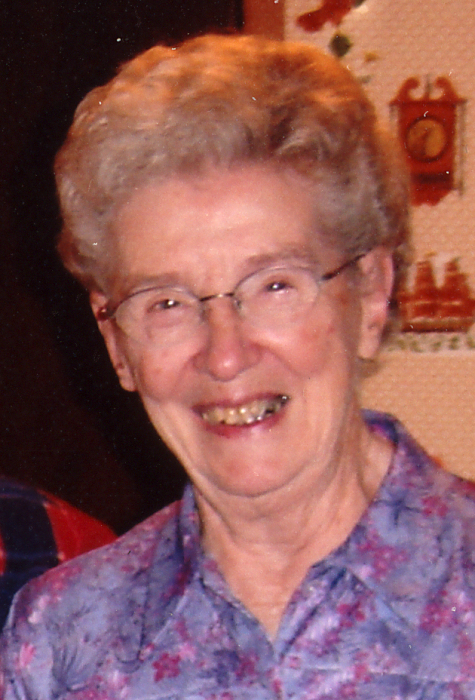 Mildred J. Kreif, 96, of West Bend, passed away on December 1st at Fond du Lac County Harbor Haven. She was born on October 4, 1922 in the town of Eden, to the late Harold and Doris (Wrucke) Johnson, and on May 6, 1944, she was united in marriage to Milton F. Kreif at the Campbellsport Reformed Church. She graduated 8th grade from the Glen Valley grade school located in the town of Eden. Four years later on May 31, 1940 she graduated from Campbellsport High School and found employment first as a maid in Fond du Lac, and later became a clerk at the Campbellsport Bakery where she would meet her future husband, Milton. Then she worked at the West Bend Woolen Mills with her husband until it burned down in 1947. Both she and her husband found employment at the West Bend Company. Three years later she quit to raise a family. Six years after their son, Tom, was born, she worked for the next nine years clerking at West Bend Smith Hardware. She reapplied at the West Bend Company, and she worked there for the next 19 years (last 11 years as foreman of the stockroom), until her retirement in February of 1985. Immediately after her retirement she worked for the following 13 years during the summer months at Boy Scouts of America Bay-Lakes Council Camp Gardner Dam as the camp's Assistant Cook and Clerk in Langlade County, Wis.
She was an active member of Immanuel United Church of Christ in West Bend and joined the Ladies Guild, Lakeland College Women's Auxiliary, National Association of the Deaf, Royal Neighbors, and the National Management Association. For the past 50 plus years Mildred has been extremely active with Boy Scouts of America mainly through Troop 780 of West Bend serving as the troop's treasurer and the Camp Gardner Dam Boy Scout Summer Camp Staff. Besides the organizations she belonged to, she enjoyed gardening, cooking, painting, and traveling. Retirement gave her the opportunity to do more extensive traveling with her family throughout the United States along with cruising on the inland rivers of the United States, Caribbean, Mediterranean, Pacific, and Atlantic. She celebrated her 91st birthday in Paris. In the Fall of 2015, she moved to Harbor Haven in Fond du Lac. Her family would like to thank the staff for the excellent care she received. Survivors include her son, Thomas Kreif of Sherwood, Wis.; one brother, George (Dorothy) Sebring of Florida; three sisters, Fern Kreif of Kewaskum, Evelyn DeSmidt of West Bend and Darlene Shaudvitis of Fond du Lac; a sister-in-law, Laverne Johnson of Grafton; other relatives and many friends. In addition to her husband she was preceded in death by her parents, and sisters Faye & Lois, and brothers Norman and Donald. Visitation with family and friends will be held on Wednesday, December 5th from 6 p.m. until 8 p.m. at the Myrhum - Patten Funeral Home (1315 W. Washington St., West Bend, WI 53095). A Funeral Service will follow the visitation from 9:30 a.m. - 11:30 a.m. at Immanuel United Church of Christ (501 Walnut St., West Bend, WI 53095) on Thursday, December 6th, with Rev. Rich Vincent officiating. The committal service at the Washington County Memorial Park is scheduled after the luncheon for family and friends at the church. Memorials to Immanuel United Church of Christ are appreciated. The Myrhum Patten Miller and Kietzer Funeral Home of West Bend is assisting the family. 262-334-2776. Online guest book and condolences may be found at www.myrhum-patten.com.